The Schmitt family » Archive for Oliver! Posted by: Bill Schmitt in Oliver! Yesterday, I posted a picture of the four people who spent the most time working on the set for the Oxford High School production of Oliver! 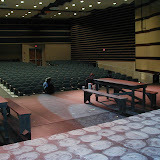 Here are some more pictures of the set itself. Not as exciting as the production, I suppose, but I took these before the actors arrived for the evenings rehearsal. Spent the last few weeks working on the sets for the play my daughter is in, Oliver. It’s the first play put on at the new High School. Pictured at left (linked to a larger version), are Tom Adamski, Len Gerwin, myself, and Len Weisgable, on the bridge at the back of the set. Lot of time, but a lot of fun, too. Then 3 performances and it all comes down. I’m going to try to get more pictures of the set to post tomorrow. You are currently browsing the archives for the 'Oliver!' category.